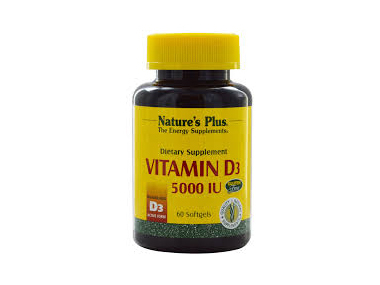 Order Natures Plus Vitamin D3 5000iu from the Online Health Food Store UK. Buy Natures Plus Vitamin D3 5000iu - 60 softgels and other quality Vitamins A - Z safely online in the UK. Natures Plus Vitamin D3 5000iu, support healthy bones naturally. If you want to automatically receive an email when 'Vitamin D3 5000iu' is back in stock, just leave your email address below. Where to buy Natures Plus Vitamin D3 5000iu safely online? Shop at the Online Health Food Store if you are wondering where you can buy Natures Plus Vitamin D3 5000iu - 60 softgels safely online in the United Kingdom. Vitamin D3 5000iu - Natures Plus Vitamin D3 5000iu - 60 softgels in Vitamins A - Z and Vitamins and Minerals.